I will make sure that your needs are taken care of when you turn to my Statesville, NC law office for assistance. If legal issues are weighing you down, you deserve focused attention throughout the duration of your case. As a dedicated advocate for your best legal interests, I will make sure that your needs are taken care of when you turn to my Statesville, North Carolina law office for assistance. There are several different types of law I practice at my law office. These include personal injury, family, estate planning, disability, traffic, and criminal law. Whether you need help navigating the emotional divorce process or need someone to defend you in court after receiving a traffic ticket, I will provide you with tenacious, focused, and unwavering legal assistance. One of the main things that sets may law office apart is the fact that I have not been an attorney throughout the duration of my entire career. After graduating from Appalachian State University, I worked as a high school educator before attending law school. My experience as a teacher has allowed me to develop the ability to explain complex legal definitions and proceedings in a way that ultimately benefits my clients and the jury during the litigation process. Remember, the legal assistance you need to overcome the difficult situation you are going through is only a short phone call away. 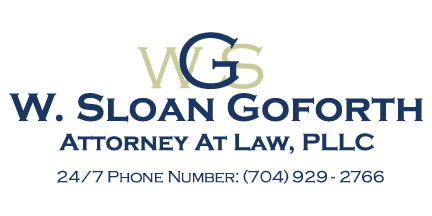 If you want to know more about my law office, what sets my legal services apart, or how I can assist you with your specific case, please contact me, W. Sloan Goforth, Attorney at Law, today. At the office of W. Sloan Goforth, Attorney at Law, our law office proudly serves residents of Statesville, Troutman, Taylorsville, Mocksville, Mooresville, Hickory, Iredell County, Alexander County, and Davie County, North Carolina.